For the first time, UK racketball players competed in the Senior World Racquetball Championships in Albuquerque, New Mexico. More than 200 racquetball and racketball players from the ages of 35 to 95-plus descended on Albuquerque for the 34th Senior World Championships in August. Perhaps descended isn’t the correct word, as the city sits at over 1,600m above sea level. Players represented 17 countries across North and South America, Africa, Europe, and Asia; USA, Mexico, and Bolivia brought the largest pool of athletes. For five days, players battled across age divisions in singles, doubles, or mixed doubles. Most entered two divisions, about a dozen entered three divisions, and one brave soul entered four! The tournament is known for its hospitality and fair play, but perhaps it is best recognised for its gruelling schedule. Most divisions comprise a round robin format which generally requires players to complete between six and 10 matches, where each match is three games to 11 (points earned only on serve). Points are earned for matches won, individual games won, and points won. Thus, winners and losers are often not determined to the very last match or even game, and those who compete in three divisions may play as many as 60-plus games to 11 in five days! There were many outstanding performances during the week but several deserve mention: Jay Munoz (USA) finished with a silver medal last year in the 35+ division but reversed the outcome by outlasting last year’s gold medalist Allan Hernandez (MEX) to take gold by only two points. Carlos Juarez (MEX) claimed the 40+ title without losing a game, mimicked by Ken Cheshire (USA) in the 45+ division. Victor Lopez (MEX) continues to build his legacy by once again claiming gold in the 50+ division. 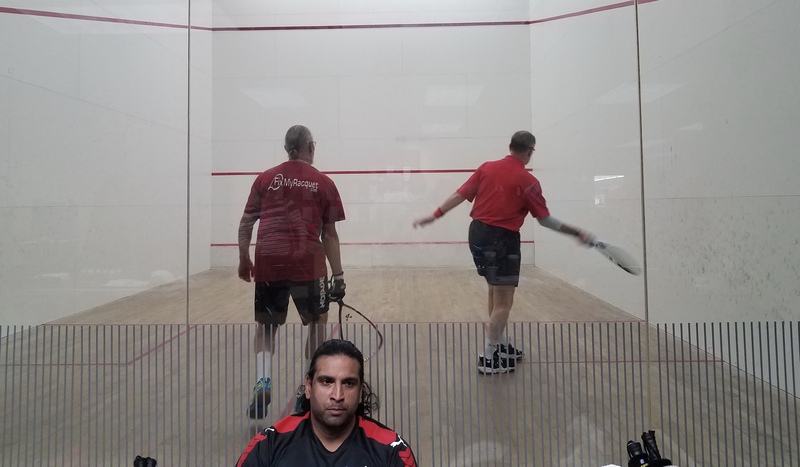 In the 55+, Richard Eisemann (USA) faced a surprise finalist in Glenn Martineau, who had a 9-2 lead in the tiebreaker, but lost nine consecutive points to hand Eisemann the title. It was a special event in the 95+ men’s division, as Lake Westphal (USA) overcame William Matotan (USA) to claim the title as the oldest champion in history. The match will soon be posted on our YouTube Channel. Westphal has aspirations to become the first to compete in the 100+ division. In the women’s divisions, Jean Halahan (USA) won the 45+ division without losing a game. Marie Gomar (GUA) took the 50+ convincingly, as did Lisa Bu (USA) in the 55+, and the 60+ was won by Cindy Tilbury (USA). European representation at the World Seniors was limited to four English and one Irish athlete. Joe Devenney (IRE) returned home with a silver in 45+ singles and a gold medal in doubles. Tim Baghurst (ENG) claimed bronze in 35+ singles and defended his doubles title for the third consecutive occasion with partner Allan Hernandez (MEX). This was the first time that the IRF have hosted a racketball/squash 57 division, which included all five Europeans. Unfortunately, due to illness Devenney was forced to withdraw, but the 35+ title was claimed by Tim Baghurst, the 40+ by Adam Grilli, the 60+ by Ian Graham, and the 70+ by Jack Clay. The exhibition event was extremely successful, and there were many racquetball participants interested in competing in the event next year. The main difference between the two codes is that the UK version is played on a squash court, with a tin, while racquetball has developed throughout the Americas on a much longer court, with no tin. A winning shot that hits the front nick, where the front wall meets the floor, is known as a roll-out. The Racquetball Senior World Championships are held annually in Albuquerque, NM, and are open to all players beginning at age 35. The tournament is known for its friendly atmosphere within a competitive environment.